I was given a design challenge by the residents of foot rot flats*, build an air conditioner that requires no mains power and no piped water. After a bit of thinking I decide to have a go at a solar powered evaporative cooler and it worked so well I thought I would make another one, and make it a bit different to make it even easier to build. The first cooler was not photographed during the build so the second cooler is better documented for instructables. *Foot rot flats small community with no power, water, toilet or pretty much anything else you would expect in a western country. There are a number of permanent residents living in illegal shacks, caravans, buses, shipping containers or camper-vans and a number of others who stay for a few weeks or months of the year but usually leave before the hot weather as it can get to 45 degrees C (113 F) for days at a time and is not unlike a small version of slab city in the US. Step 1: Is a Evaporative Cooler Right for Your Location? Before you start you need to understand that an evaporative (or swampy) cooler will only work if you live in an area with low humidity. If your not sure if your area is suitable, a good indication is have a look at houses in the area, do they have swampy coolers on the roof, or are they all refrigerated coolers? Swampy coolers have some advantages over a refrigerated coolers, the most attractive though is there low energy consumption. Will still work well in a poorly insulated drafty building. The technology for evaporative coolers is very simple, and there are fewer working parts, which means maintenance and repair costs are low. Swampy coolers use a lot of water around 1000 liters a week. Cant be used in areas of high humidity, evaporative cooling works best in dry climates. Too much moisture in the outside air makes the system work inefficiently and moisture can build up, causing condensation and make the air muggy and uncomfortable. Pads can harbor mold if not serviced, which is very unhealthy if mold spaws are blown inside. 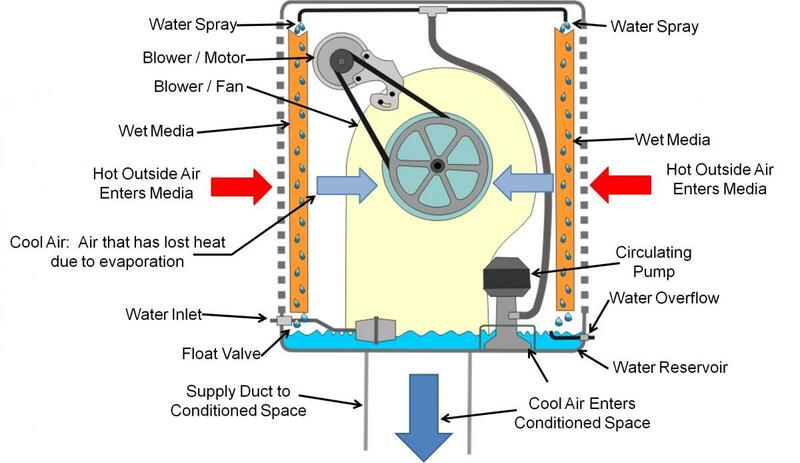 Because evaporative coolers are so simple you wont need many parts, but you will need to think about the voltage you want to use and also the availability of a tread mill motor, which can be difficult to find. I have found them at the local dump, but they are sometimes available on ebay. The motors are a permanent magnet type and are rated at 100 volts or more, but run well at at 24-48 volts and are perfect for an air conditioner with a fan. If you want to run your air conditioner on 12 volts you can use a big thermo fan with a speed controller, to cut down the speed and noise of the fan. If you don't have running water you will need a reservoir, an IBC container is perfect as is can double as a stand for the air con unit. Second hand evaporative cooler, you only really need the box and the pads. Wires, switch, screws, tape, tools, etc. solar panel with regulator and battery, or capacity on your existing system. This is the first solar air conditioner I built, I didn't take many photos of the build (silly me), but it was a little hard to take photos every few minutes as the resident and his kids were helping. It runs on 24 volts from an existing solar power system, and uses a tread mill motor and the original fan with no speed control. The pump is a 24 volt unit, and both the fan and pump are wired to a single switch, so the unit is either off or on. The IBC container is full of water and acts as a reservoir and surprisingly only lasts for a week or so before having to be refilled. The pitch on the blades were adjusted to tune the motor / fan to get the best air flow from the power supply. The air con has been fitted to a window on the building, which is a shipping container with a lean to. The temperature inside the building used to be unbearable, and a health hazard on hot days 45C + is now very comfortable and at times a little too cold. The unit works just as well as the factory cooler I have on the roof in my own home, so overall well worth the time an effort. This air conditioner unit is quite different internally to the first one as it has a squirrel blower fan. I decided to remove the whole assembly and use a radiator thermo fan on the side of the unit and sits on the ground for a number of reasons. The resident wants to run it on 12 volts and the minimum voltage for a tread mill motor to produce a useful amount of power is 24 volts. The blower unit could be sold to offset the cost. The unit is much bigger than it needs to be for the space it will cool, so losing one pad wont be a problem. The unit will sit on the ground and blow through a hole in the wall, so having the outlet on the side will reduce the ducting needed. As the unit is on the ground I wont have to pump water 4 meters into the air or worry about mounting the contraption on an already rickety and leaky roof. Striping the unit is simple just remove the pump, blower unit and any wiring. If you are going to use an IBC as a reservoir you can also remove the float valve, but if you have running water you can leave it on and mount the new DC pump inside the air con unit. If your lucky someone might want to buy the blower and pump, and i was able to sell the blower to a guy who wanted some ventilation on his plasma cutter machine. I was able to get the blower unit working and it moves a lot of air, as you can see, Jade is testing the wind speed. I was able to get this evaporative cooler unit for 1/2 price as it had been dropped off a forklift and the plastic tank was a bit damaged. The tank was repaired with. The secret to getting a good plastic repair is to clean everything with Acetone, use good quality hot glue sticks and get the glue gun really hot. It should be left on for half an hour or so before use and the glue needs to be hot enough to melt the plastic your trying to repair. I used an plastic oil container to make patches and hot glued everything in place. You need to really watch your fingers as the glue will burn you pretty good if you get some on yourself. I used blocks of wood and a hammer to hold everything in place while the glue set. Step 7: Blocking Up Some More Holes. As the cooler needs the air to exit out the side of the unit there are a few more hole the need to be blocked up. First there is a tube that runs around the top which supplies water to the pads. So the holes on one side is blocked up with hot glue, as there is very little pressure the glue will be adequate to stop the water flow on that side of the cooler unit. The large air outlet hole was simple blocked off with a piece of plywood which is screwed into place and then two square steel bars were screwed in place across the bottom, so the cooler unit can be sat on top of the 1000 liter IBC container. Apart from connecting the solar pumps hose to the water outlet at the top of the unit, the box is finished, so can be rolled over and fitted to the IBC tank. The fan is a 16 inch 12 volt unit rated at 80 watts although dropping the speed with a speed controller will lower the energy consumption significantly and also reduce the noise. The fan was fitted to the side of the cooler unit, but there is no reason why it couldn't be put in the bottom original position. One of the pad was removed from its cover and a hole cut with tin snips. The louvers were then flattened out with a hammer and block of wood and the inside sealed up with gaffa tape. The fan was then attached to the cover with tek screws then fitted back onto the air con unit. The cooler unit was installed at the back of a shack on top of a IBC container that acts as a reservoir for the water. The hardest part of this project was cutting a hole in the wall, as it had a layer of plastic coated foam inside the wall which would melt when cut with a jigsaw and clog up the blade. The speed controller wiring and switch were hooked up and connected to the 12volt battery bank. The system was turned on and it was soon blowing cool air inside. One of the problems with 12 volts is the voltage drop over distance, so the fan was only getting around 7 volts due the battery bank been about 12 meters away. So the fan wasn't moving as much air as expected, so I gave the resident the option of either use heavy wiring, or putting a battery close to the cooler unit and connecting a solar panel to it. He choose to run heaver wiring, and as he's always strapped for cash we run 2 extension cords(1 for +and 1 for -) from the battery bank to the cooler, not perfect but much better than the other crappy wiring he had. We ended up with 11 volts at the fan, not perfect but Ok for what i had to work with. I like to leave projects like this a little unfinished so the resident, can take so ownership and help them selves a bit. His imagination is quite good and after toying with the idea of a toilet seat.... he came up with a plastic drum lid to blank of the air con when not in use and to tidy up the hole in the wall. He also had the task of sealing the gap between the fan and the wall which he did with some old foam rubber. If you live of grid in an area with low humidity this project is well worth the time effort, both coolers use about 100 watts of power running flat out, but the amount of water they use is quite significant.The performance of both coolers is very good in fact almost the same as a cooler running on 240 volts. The tread mill motor version is slightly better as it defiantly moves more air for the same amount of power and is quieter, so if you can find a dead treadmill that would be the version I would advise you to make. liquidhandwash, good job on reusing old swamp coolers and making repair patches out of scraps. I grew up on swamp coolers in Texas back in the 60-70s and they cooled the house very well. we use to fill our swamp cooler with a garden hose or when we collected rain water we dumped it into the tank by hand. Collecting rain water on a roof tank also works, which is what I saw in Iraq and in Central and South America. Collecting evaporated water like you would in survival techniques would not yield enough water for your climate. In Central and South America it could work but again it would only yield a small amount of water. Wish you had pictures connecting the power up to the solar panels and how many solar panels it takes to power the swamp cooler. Thanks for your comments, the residents can pump water from a creek that is near by, but the water is of poor quality. We get a bit of rain in winter, which they store in tanks. Both of the swampys were connected to a battery bank that are charged either with solar panels or a generator and have other items running off the battery. I would expect that you would want a lest 200 watts of panels, to both charge the battery and run the cooler. The only loss of water should be through evaporation in the pads. Excellent documentation! You mention one of the downsides of swamp coolers is the water loss. Which makes me wonder... is there some way to recapture any of that water so it could be recycled back to the cooler? The water evaporates and goes into the air, Its how they work, so it would not be easy to recapture the water. Does anyone have an idea on how to reclaim any water from the air after it has been cooled via evaporation? I'm imagining a condenser like on an alcohol distiller but I don't think it would work at the temperatures being used very well. If it's at all possible then the process would be much less water-intensive.